Show your Love with The Bouqs! Coffee Lovers, Say Good Morning to Your New Best Friend! Valentine’s Day is on its way. The most romantic day of the year! You really want to make an impression whether you’re celebrating with your significant other or just because! 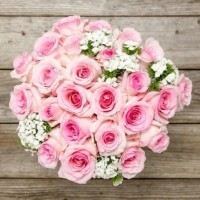 What would be more thoughtful gift than a fresh flower arrangement? If you ask me, the ideal place is The Bouqs! I recently received a bouquet from this store and was amazed by the long-lasting freshness and wonderful aroma of their flowers. Their florals ship fresh from eco-friendly, sustainable farms, so they last. Your bouquet will be even more meaningful when arrives personalized in some way. 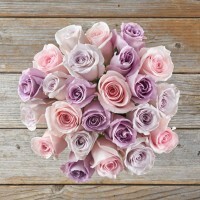 Don’t be afraid to mix and match different flowers to create a lovely arrangement that matches your valentine’s style. Go against the grain and don’t choose roses! Other flowers are very impressive as well! Show your valentine affection with ‘My Girl’ bouquet from The Bouqs, that includes pink and white tulips, plus Sugarfina candy. Tulips are a fan favorite for Valentine’s Day. A perfect gift full of bright romantic colors and chocolate pleasure! A bolder statement of love and appreciation would be ‘All of my heart’ bundle. 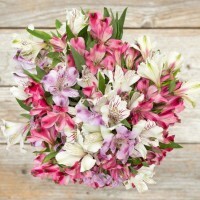 These flowers include pink, white & purple alstroemerias, also known as ‘Peruvian lilies’. These delicate blooms create the most romantic atmosphere! A real blast of vibrant colors. Many other occasions apart from Valentine’s Day require thankful gifts such as flowers! Don’t forget that Mother’s Day is also approaching and all mothers in the world deserve tons of love! The perfect florals for mothers are good old-fashioned roses. Pick the color they prefer, and they’ll be always grateful! It’s the least you can offer them, so make sure that you’ll order a big pinkish purple arrangement, a special symbol of admiration. Both ‘Above & Beyond’ and ‘Splendor’ bouquets from The Bouqs are perfect choices for every mother! No matter which flowers you decide to offer, the kind gesture of giving is all that counts. Purchase your flowers online at The Bouqs and schedule your order in advance, so it is delivered to your loved one in time! 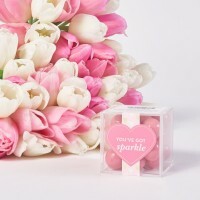 Don’t forget to visit Couponology.com and use our 20% off exclusive Valentine’s Day code!